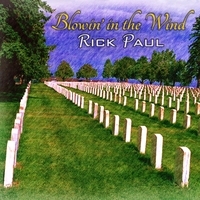 Modern rock cover of Bob Dylan's classic song about peace, war, and freedom. I originally arranged and recorded Bob Dylan's "Blowin' in the Wind" in a modern rock style for a reality TV show audition back in 2006. While I never got anywhere with that audition, I always liked the unique arrangement I'd put together for that recording. However, the recording sat on the shelf for over a decade before I decided late in 2016 to remix it for release in early 2017. This single is that remix.